Hi guys! How are you all doing today? 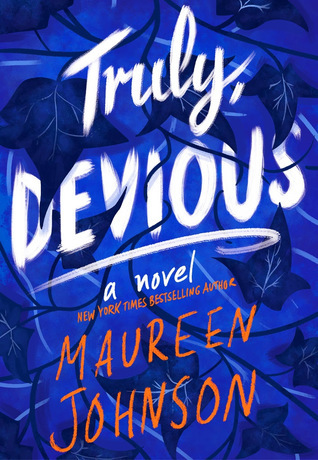 I love mysteries, so when I found out Maureen Johnson was writing another mystery I was extremely excited. I had the opportunity to read this thanks to her publicist reaching out to me for a review. I NEED THE SECOND BOOK IN MY HANDS NOW. OH MY GOODNESS🤤 What a fantastic mystery by an excellent author! Johnson is a *truly* fabulous author and I’m so glad to have read her latest! Once I was close to the end of the book I COULD NOT PUT IT DOWN. It was so amazing and gorgeous. I can’t wait for the second book, LIKE I HAVE QUESTIONS PEOPLE. THEY NEED TO BE ANSWERED! The plot was very intricate and I love how it all twisted in ways that you thought you knew what was going to happen, but you ended up being completely wrong. I thought the end was going to be so many different things. I’m dying to know where the next book will take us! I love the cast of characters in this book. Something that Stevie openly struggles with in the book are mental health problems. While this is plainly seen, it isn’t the central focus of the novel. I like this representation and how it talks about how Stevie lives with her mental illness. Another thing Stevie struggles with is feeling like she fits in at Ellingham. All of the students have a thing that they are there for and Stevie is there to specifically solve the Ellingham case. She feels a bit like an impostor for being there, but I think this is what moves the plot forward. Stevie’s friends Janelle and Nate are fun. I like their different relationships and how they are with each other. They aren’t quite as tight as other trios, but I think is what sets them out from the rest. There are a lot of friends groups that I know where everyone isn’t as close as you would think them to be. I feel that despite them not being as close they understand each other well. I can’t wait to see more of them in the next book(s)!! One of my favorite parts of the book is the element of true crime. I recently got into BuzzFeed Unsolved series on YouTube, and ugh, I look forward to it every Friday night. I really connected with Stevie over this, and I wonder if she would follow the series too. All in all, this was a wonderful book. I highly recommend it to crime lovers and people who love a good mystery.